I bought a large bottom sirloin roast a few weeks ago and as I was cleaning up the freezer, I decided to cook it for dinner and maybe replicate the same recipe for Christmas. 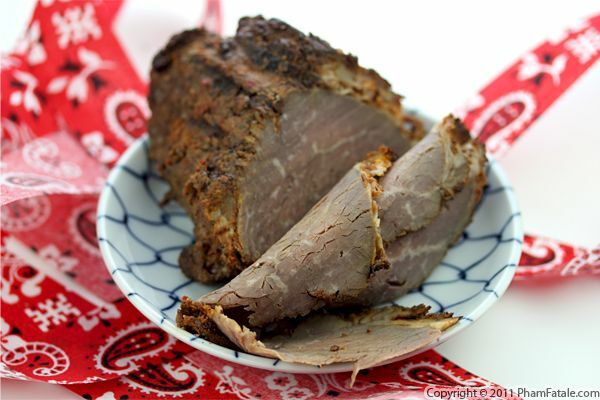 If you’re not sure what you’d like to serve as the main course for your holiday meal, I'd like to suggest that a homemade roast beef is a great (and delicious) option. 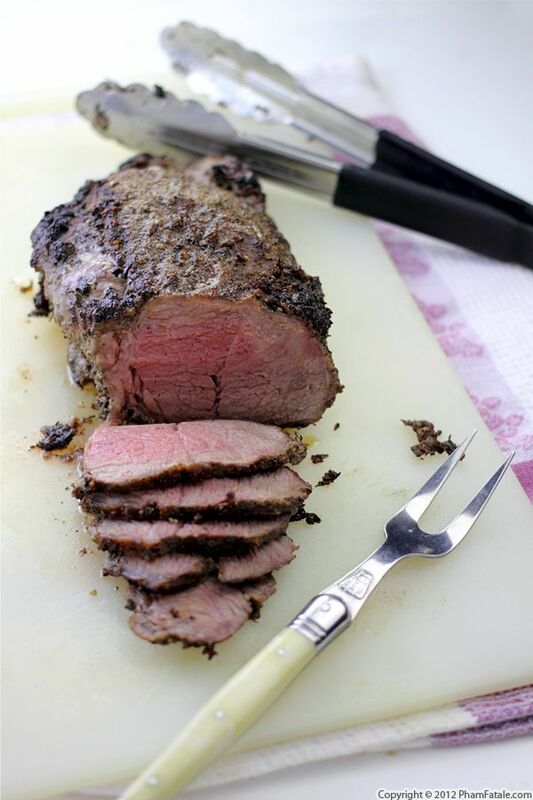 This recipe is my favorite way to prepare a large bottom sirloin roast. The marinade is a combination of coarse-grained mustard, horseradish, miso and rosemary. I've heard many times that the cooking time depends on the weight of the piece of roast, ranging from 16 minutes per pound for a rare, pink color, all the way up to 30 minutes per pound if you like it well done. My method is much easier; simply insert a probe to capture the temperature in the center of the meat and wait until the internal temperature reaches 145°F for just the right amount of pink. Probe thermometers are awesome! To keep the meat from burning at the bottom, I also placed a bed of vegetables such as celery stalk, turnips and carrots and filled the bottom with a little beef broth. Enjoy! If you're having trouble cooking red meat to perfect doneness, this recipe is for you because I believe it's fool-proof. I used a bottom sirloin tri-tip roast and marinated it overnight. To ensure the meat is properly seasoned, I placed a spicy marinade (I used homemade chili garlic sauce from last summer, onion purée, maple syrup and cinnamon) in a bag and vacuum-sealed it. The following day, I seared the meat to create an outer crust and the juice remained inside for optimum tenderness. The meat roasted in the oven until the probe thermometer indicated the right internal temperature. It was quite a large piece of meat; if wrapped properly, you can carve the meat and make the best roast beef sandwich the next day! For all you beef lovers out there, don't forget, La Cense Beef is offering a special deal to Pham Fatale readers. You can get $20 off 8 10-ounce ribeye steaks, plus 1 lb of free meatballs, all with free shipping! If that's too much meat for you, La Cense is also offering $10 off 4 10-ounce ribeye steaks. The offer ends soon, so take advantage of it now if you need steaks from Valentine’s Day, or for any other special occasion you might be planning! The top photo was taken the following day.